Deficit rainfall, reduced sowing: Estimates overstate food grain produce? 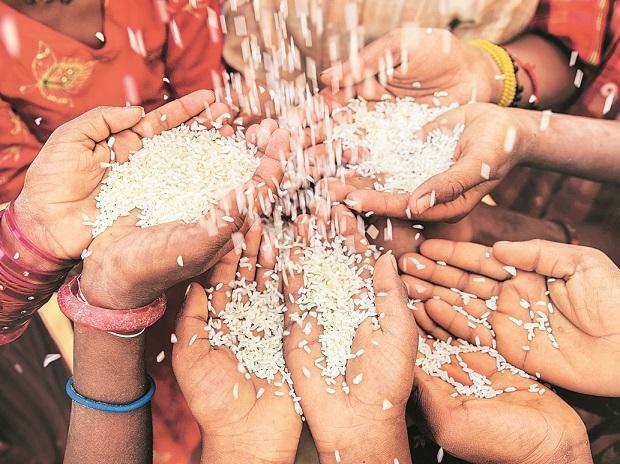 The record paddy procurement of 4.65 million tonnes (MT) so far in the current kharif marketing season is testing the food grain storage capacity in Uttar Pradesh. According to sources, the state currently has warehousing capacity of nearly 5.4 MT, which has inhibited any procurement beyond a point, although the procurement potential was much higher than the target of 5 MT for paddy this season. Against the target of 5 MT, the 3,253 state run procurement centres have already clocked nearly 4.65 MT of the cash crop, which corresponds to 93% of the target and counting. In 2015-16, the state had registered the second highest level of paddy procurement at a little more than 43 MT. “The annual procurement is projected to rise by 5% every year, so we have planned to ramp up warehousing capacity to 8 MT over the next 5 years,” a senior food department official said. Fresh storage capacity of 1.2 MT is being created in the government sector with additional 0.6 MT in the private sector under the Private Entrepreneurs Guarantee (PEG) scheme, totalling 1.8 MT, which would be available within the next 2 years. The state farmers had already been paid about Rs 8,225 crore against the procurement. Ahead of the 2019 Lok Sabha elections, the ruling Bharatiya Janata Party (BJP) does not want to give any leeway to opposition to corner the government over agricultural issues, including farm distress or slow procurement. In 2016-17 and 2017-18 seasons, the government could achieve paddy procurement of only 3.5 MT and 4.3 MT respectively against the target of 5 MT. The procurement process was slower in the initial months, which had also attracted the ire of the chief minister. Later, the government relaxed online verification for procurement of up to 10 tonnes, which boosted the process. Procurement had started from October 1 in western UP and a few central UP districts. It continued until the end of January 2019. The process in eastern UP and the remaining central UP districts started from November 1 and will continue till the end of February 2019. This season, the state had hiked the paddy minimum support price (MSP) by Rs 180 to Rs 200 per quintal (100 kg). The price was revised from Rs 1,550 per quintal to Rs 1,750 per quintal for the common variety, the corresponding figure for Grade-A paddy was increased from Rs 1,590 per quintal to Rs 1,770 per quintal. For robust procurement of paddy, the state announced bonus of Rs 20 per quintal over MSP, up from the Rs 15 per quintal bonus last year. This year, UP paddy acreage is estimated at 6 million hectares (MH). The state is among the top food grains producers, including paddy, wheat, maize, apart from millets and coarse grains.